I’ve had the most boring Saturday ever..however I hope you all had a good eventful Saturday ensuring you got all your last minute shopping done. There’s only 6 days until Christmas! Today’s post is my idea of the perfect night in for A/W and especially as Christmas is occurring cosy nights in are the best at this time of the year. 1// Cosy Blanket to keep you warm – As its winter you need to be cosy on the sofa and there’s only one formula for this and that’s having a chunky blanket to keep you nice and warm. 2// Peanut butter hot drink – Peanut Hottie I mentioned this in my bloggers review box post. Since then I’ve tried this and I really enjoy drinking it. So to also keep you warm and as a treat have your favourite hot drink whether its hot chocolate, tea or coffee. 3// Favourite chocolate – Maltesers. As another treat have your favourite chocolate whilst watching a Christmas film. 4// Love Heart Scented Tea Lights – Debenhams. Tea lights and candles are a lovely companion as well as having the light dimmed to have the calm and collected atmosphere. 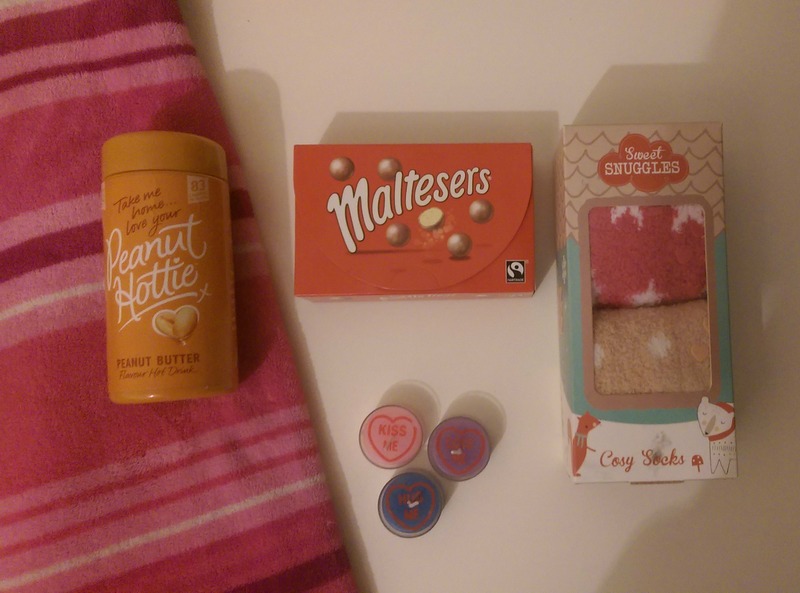 5// Sweet Snuggles Cosy Socks – Superdrug. Finally, have something warm on your feet whether its snug socks or slippers. 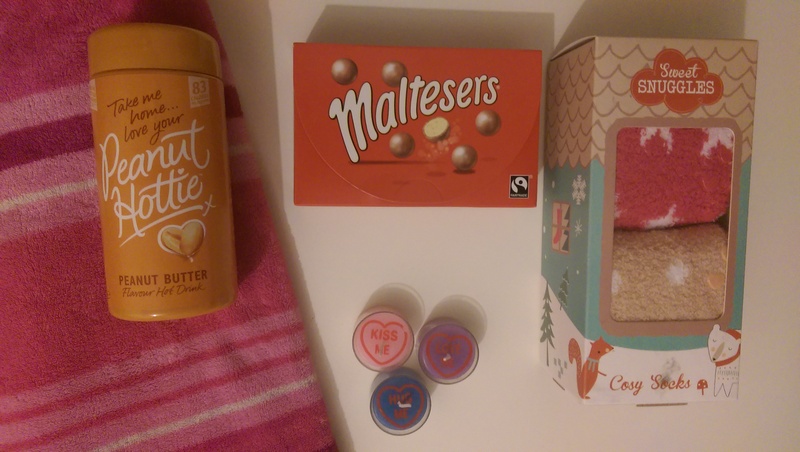 I got this off my secret santa as well as a few other goodies which I cannot wait to try! What’s your idea of a perfect night in? Comment below. Yeah you need to try it!! !